I love a good inspirational quote. 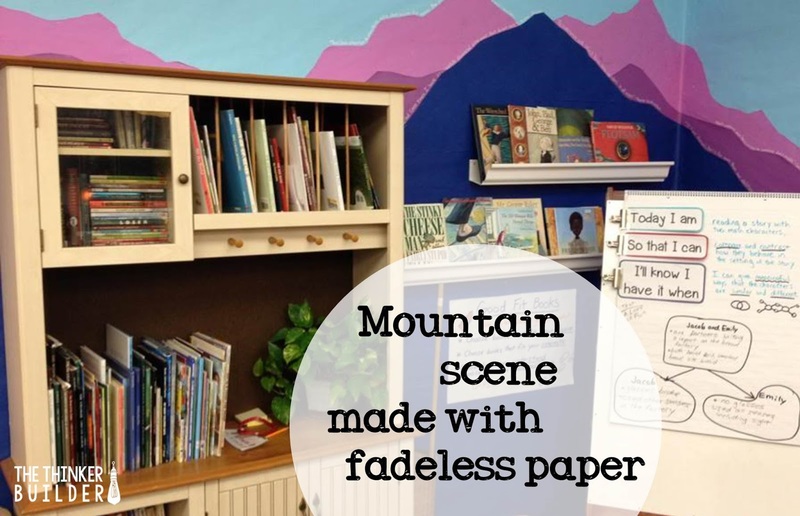 I also like displaying them in my classroom. 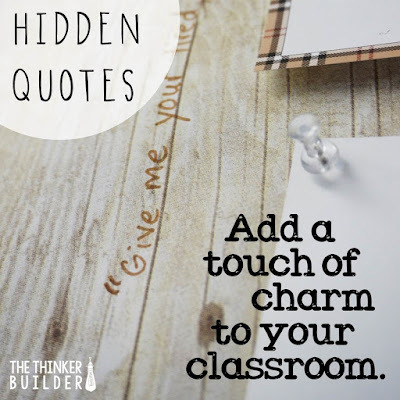 But one of my favorite little tricks is to hide some quotes into the design of my classroom. It's easy, it adds a bit of charm, and it can be just as powerful as a quote displayed in a more traditional way. 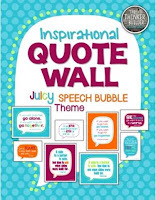 See, I like to think that when one of my students notices one of the hidden quotes, he or she must have discovered that particular quote at that particular moment for a reason. Maybe she needed a little pick-me-up. Maybe he needed a spark of motivation. Let me show you a few ways I hide quotes around my classroom. One place I have written a favorite quote is on the wall next to my desk, where I pin certain things like schedules and lists. You can see part of the quote in the picture above. 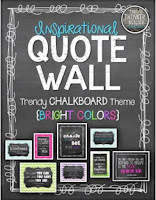 The wall is covered with paper that looks like weathered wood, and I wrote the quote vertically along one of the planks. The quote is by Emma Lazarus and is also inscribed on the Statue of Liberty: "Give me your tired, your poor, your huddled masses yearning to be free." That one has always resonated with me as a teacher. 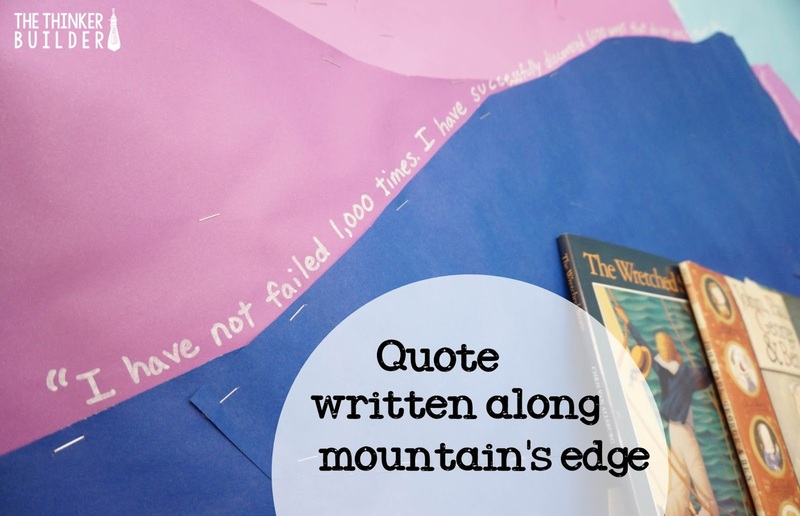 I wrote several quotes into the background of one corner of my classroom. Do you see them? With a silver Sharpie, I wrote a few favorite quotes along the edge of the mountains. The one below is from Thomas Edison: "I have not failed 1,000 times. I have successfully discovered 1,000 ways that will not work." The one below is from Margaret Mead: "Never doubt that a small group of thoughtful, committed citizens can change the world. Indeed, it is the only thing that ever has." 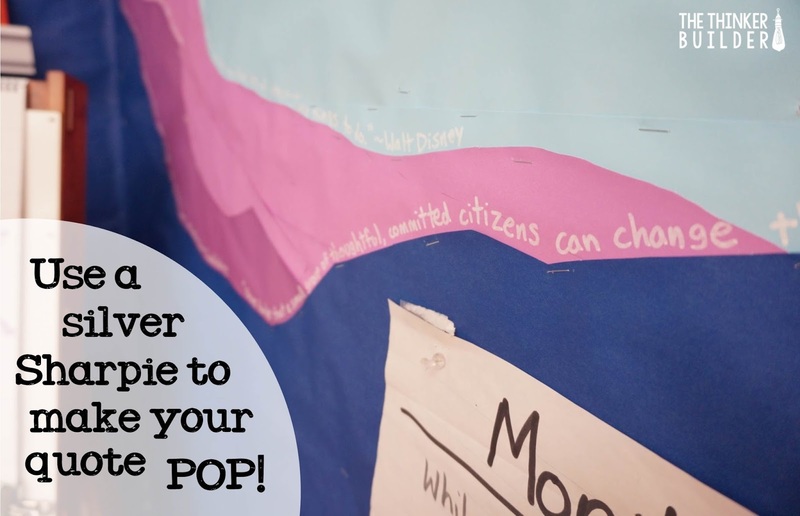 Sometimes students notice one of the quotes, and they step up close and tilt their head, and they read it quietly and walk away. Other times students see one and point and tell me that someone wrote on my wall, and then we stop and talk about the quote and what it might mean. Regardless, the quotes are written in a way they've not seen before, and often that's all it takes for it to make an impact, even a small, hidden one. I enjoy my inconspicuous quotes, but I also like hanging a few quote posters. 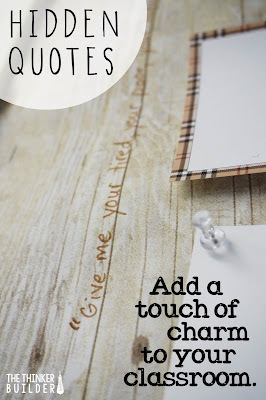 One of my favorite ideas is to arrange several quotes in a stylish display. 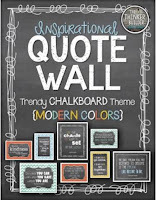 I've put together ten of my very favorite quotes into coordinated sets, in a "trendy chalkboard" theme (modern colors or bright colors) and a "speech bubble" theme (juicy colors). 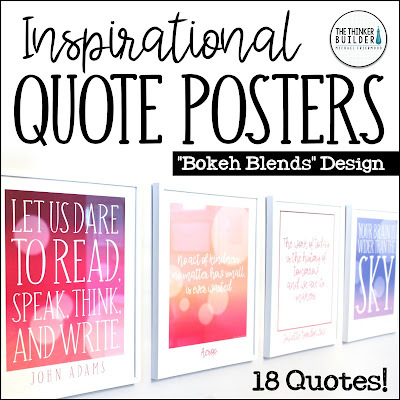 And my latest set includes 18 quotes in a fresh "Bokeh Blends" design.